His Holiness Patriarch Kirill of Moscow and All Russia says that the basis for the 1917 Bolshevik Revolution was the loss of spiritual values within the people of the nation. “The events of 1917 and the dramatic consequences that followed had profound spiritual causes. 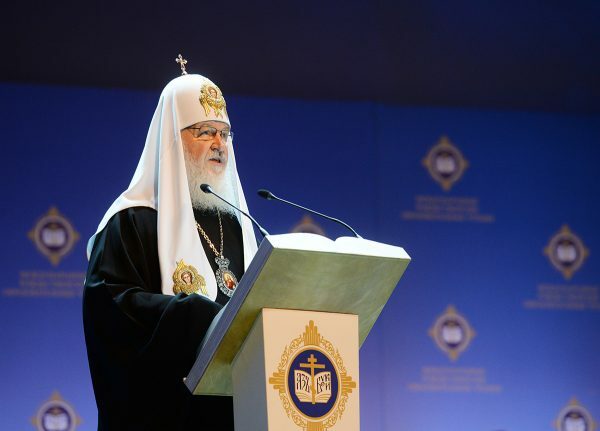 The fundamental break in the traditional way of life-I am not talking about the administrative or political model, but about the spiritual and cultural self-identity of the people-became possible only because the daily life of people, first of all among the elites, lost something very important,” said the Patriarch as he spoke to the State Kremlin Palace during the opening of the 25th International Nativity Readings, dedicated this year to the 100th anniversary of the Revolution. “The main tragedy of the people was that, having become intoxicated with dubious populist ideas, they allowed the falsification of their national historical memory, they came to disdain their own traditions, established by the efforts of their ancestors over centuries, allowing themselves to be divided into warring factions, giving political and social divisions priority over national unity and cultural cohesiveness,” noted the Primate of the Russian Orthodox Church. His Holiness Patriarch Kirill feels that the problem remains of there being a real need to examine the history of our Fatherland from 1917-2017, requiring “a systemic, balanced understanding of the reasons and consequences of the events,” based on an exhaustive and honest evaluation. His Holiness recalled the podvigi [spiritual feats] of the New Martyrs who died for the faith during the Soviet years, which became “a spiritual foundation upon which faith has been reborn in our lands,” and reported that the Host of New Martyrs of the Russian Church now includes over 1,700 names. He pointed out that the shock of the 20th century teaches us that the desire to consolidate society, and not division according to social, political or other reasons, should lie at the basis of any transformation. “The main lesson we must glean from the last century is that we cannot build human life and society without God. Such societies, in the words of Holy Scripture, are ‘houses built upon the sand,’” stressed His Holiness Patriarch Kirill. “The people become a nation when they live with common spiritual and moral values, cultural conceptions, recognizing their bonds with the past and open to the future in solidarity with one another. Such a nation will be truly viable and will be able to elude catastrophes such as we experience in the last hundred years,” added His Holiness.